When ever i need to work with different color combinations while working with HTML design of the pages i usually follow the following rules and links. Colors are defined using a hexadecimal notation for the combination of Red, Green, and Blue color values (RGB). The lowest value that can be given to one light source is 0 (hex #00). The highest value is 255 (hex #FF). HTML colors are defined using a hexadecimal notation for the combination of Red, Green, and Blue color values (RGB). The lowest value that can be given to one of the light sources is 0 (hex #00). The highest value is 255 (hex #FF). 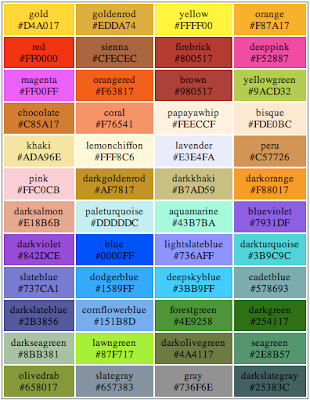 The table below provides a list of color names. 0 comments to "Web Pages - HTML Colors"